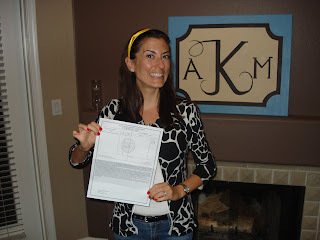 My provisional Arizona Teaching Credential arrived in the mail this past weekend! With this I can officially start teaching in our new state! To clear the credential there are a series of requirements I still need to fulfill (including taking an Arizona Constitution class), but for now I'm excited about going back into the classroom as a substitute teacher and getting to know our local schools! Yay! It was so nice chatting yesterday. I miss you! !